Cold Air Currents: Europe Burns Coal Fastest Since 2006 in Boost for U.S. The price angle does not provide the entire story on the increased use of coal. Part of the story is technology related to supply mixes that include, in Europe, an increasing amount of intermittent, wind and solar, generators. The existing coal fleet, though running at vastly reduced levels from previous years, provides the IESO with desirable flexibility under all operating conditions. As Ontario’s coal‐fired generation is shutdown over the next two years, the associated flexibility with them will be removed. As a result, new capacity should also have this flexibility to help facilitate the management of maintenance outages, provide effective ramp capability and even provide regulation, when necessary. The flexibility noted now by the IESO has long been noted by retired nuclear Donald Jones, P. Eng. (a contributor to this blog). Coal has a dispatchable range of 20 to 100 percent full power compared to around 70 to 100 percent for combined cycle gas, which means more non-GHG emitting nuclear would be shutdown (with consequent wear and tear costs) or powered down to avoid SBG by using gas than by using coal. This would lead to an increase in carbon dioxide emissions even though carbon dioxide emissions from a combined cycle gas turbine plant are just over half the amount from a coal-fired plant for the same output. For gas to provide the same dispatchable power as coal, with both operating at their respective minimum loading points, several times as much gas generation would have to be on line meaning very much more GHG emissions. Under these circumstances coal, rather than gas, would make a better partner for wind. The utility of existing coal plants, coupled with the declining utilization rates resulting from demand stagnation/decline and requirements to take all intermittent/renewable generation, is serving to discourage any new generation capacity. At the same time, the operators of coal units seem increasingly skillful at running the units as intermediate, and even peaking, generation sources, instead of a baseload sources. The economic story is also compelling. Severin Borenstein is one economist dealing with the relationship between increasing requirements for preferred renewable sources, and decreased pricing for fossil fuels. The size of the impact on prices is also questionable. While some advocates have focused on short-run price variation, the impact of a long-term shift towards renewables will depend on the long-run elasticity of supply for natural gas and coal. With the advent of hydraulic fracturing, it seems likely that the long-run elasticity of natural gas supply has probably become quite high. The long-run elasticity of coal supply is generally seen as quite high as well (Miller, Wolak and Zhang (2011)). Thus, a shift to renewables is not likely have a large impact on fossil fuel prices. The longer term is inability to impact fossil fuel prices may already be taking shape. The high elasticity of natural gas and coal is due to the ability, on the reduced supply side, by the ability to leave the resource in the ground. And this week brought news of disinterest in new coal supply in the US in addition to new indications of a reduction in gas drilling. Europe is likely getting coal cheap now as US demand for it is sliding , largely due to the cheap natural gas pricing due to technological innovation in drilling. 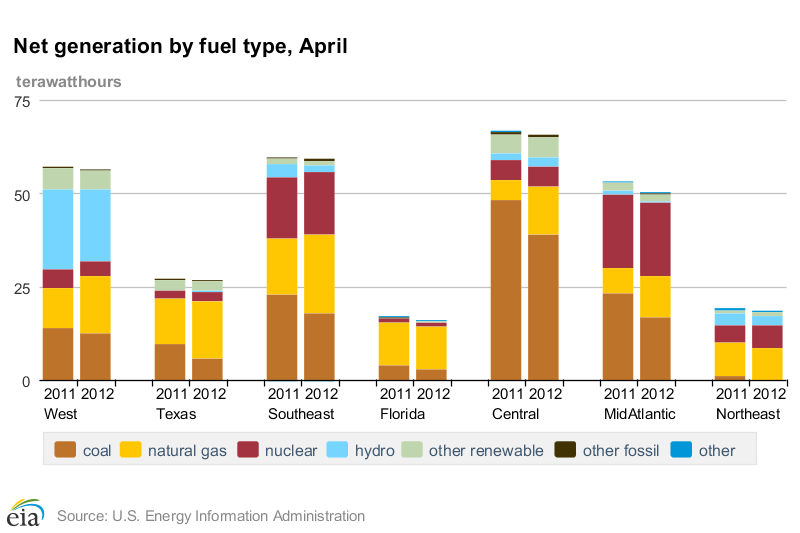 April EIA data showed natural gas generation equaling coal's, with residential demand down 6%. Once the inventories are cleared, the coal price is unlikely to stay low - while Europe will remain in need of coal long into the future.